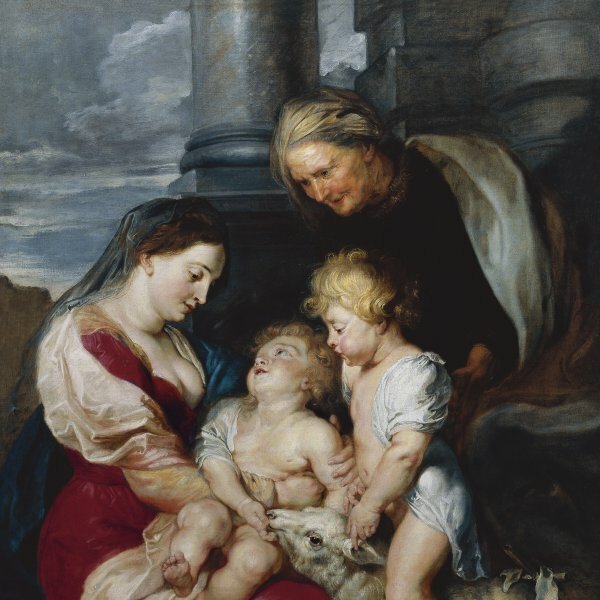 Rubens was the most outstanding of all Flemish painters, and a leading exponent of Baroque art. The Toilet of Venus is one of his copies of an original by Titian—now lost—which belonged to the Spanish royal collections. This provenance is supported by two significant details: the pearl bracelet and the ring on Venus’ left little finger, both of which appeared in Titian’s painting. An original version close to the one by Titian is now at the National Gallery of Washington, and there is another canvas by Rubens in the Liechtenstein Collection in Vaduz. The Flemish painter’s subtlety of execution and superb mastery of colour are the most distinctive features of his style. In his Arte de la Pintura, Pacheco left a significant account of Rubens’ second trip to Spain of 1628–29 (following his first trip of 1603). Pacheco mentions some of Rubens’ activities at the court in Madrid where he copied “all the works by Titian belonging to the King, which are the two scenes of bathing, the Europa, the Venus and Adonis, the Venus and Cupid, the Adam and Eve, and others.” The presence of a painting by Titian of Venus and Cupid, with a brief description, is also recorded in the account by Cassiano del Pozzo of 1626 of his visit to the old royal palace or Alcázar in Madrid, in particular to the king’s summer apartments. An inventory of paintings in the Alcázar dated 1636 and drawn up by order of Philip IV at the time when Simón Rodríguez became keeper of the paintings in the palace, replacing Juan Gómez de Mora, offers a more precise description of the painting that hung in the king’s bedroom in the Lower Summer Quarters: “An oil painting, of a Venus, with bare breasts, dressed for rising from bed, in red, with a pearl bracelet on her right hand, and a ring on the little finger of her left hand, and Cupid in front of her, naked with a mirror in which she is looking, by the hand of Titian and with a gold and black frame.” This original work by Titian belonged to Philip IV and is recorded in the old inventories of the Alcázar. It survived the fire of 1734 but disappeared in the Peninsular War. The description in the 1636 inventory of this work by Titian is extremely close to Rubens’ painting. We thus see Venus in a white shift, partly covered with a crimson cloak. The goddess, who covers one breast with her gown, looks into a mirror held up by Cupid, who has laid down his bow and arrows beside him at his feet. In particular, we find two details mentioned in the description of 1636 and which Rubens repeated: the pearl bracelet and the ring. Titian’s painting is now known from an autograph version in the National Gallery of Art, Washington. It reveals some differences with respect to the present painting, such as the presence of a second Cupid about to crown Venus with flowers, as well as other variations in the drapery covering her, the position of Cupid holding up the mirror and other elements in the setting. 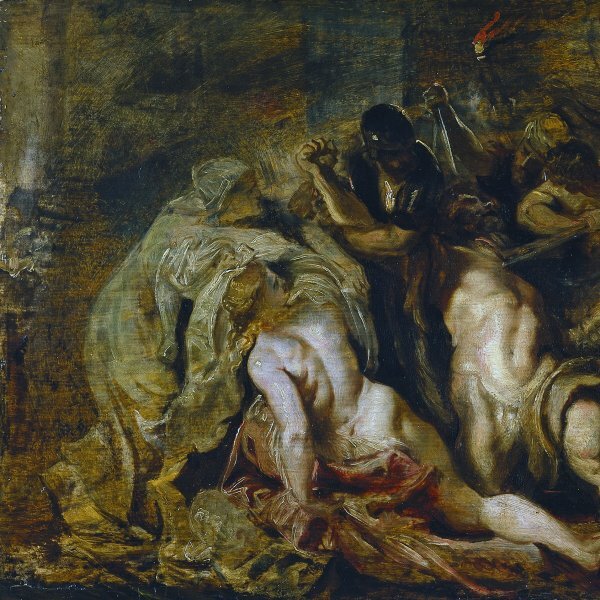 The present canvas has been identified as one of the canvases that were recorded in the inventory of Rubens’ possessions drawn up on his death in 1640, although it has also been suggested that the work mentioned in Rubens’ inventory could be the panel of the same subject now in the Liechtenstein Collection in Vaduz. 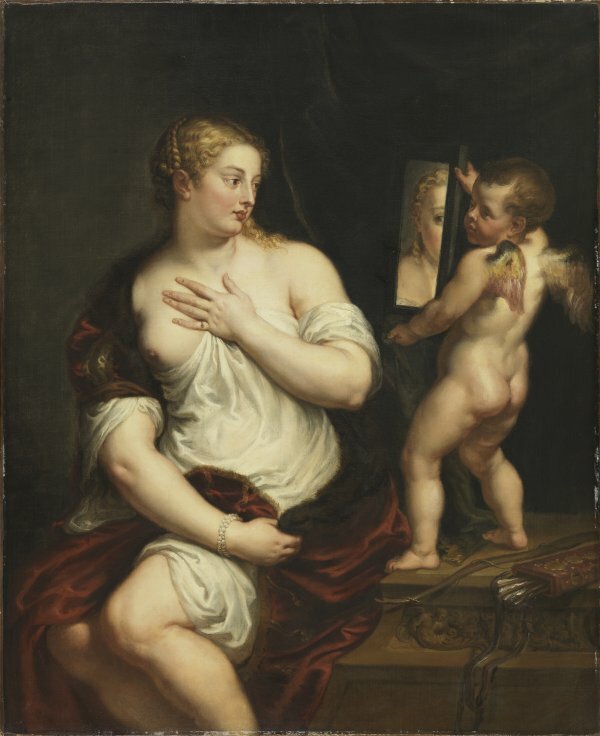 In that work, Rubens reconsidered the composition and painted Venus seen from behind with her face shown in more than three-quarters in Cupid’s mirror. The 1640 inventory of the artist’s goods also includes eleven of his copies of works by Titian made in Spain, Italy and elsewhere. The date of the present canvas has been much debated. Burchard considered that it must date from before 1615, while Held thought that it must date from 1620 or later. Bearing in mind earlier opinions, Gaskell suggested that the painting dates from around 1606–11 and may have been based on an original work by Titian that Rubens would have seen in Italy or Antwerp. In the catalogue of the exhibition of works from the Collection held in the US between 1979 and 1981, Rosenbaum was of the same opinion. The canvas entered the Collection in 1957 from the Antiquitäten und Gemälde gallery in Hergiswil. In 1956 it was exhibited at the Rosenberg & Stiebel gallery in New York.